Community Protest Banner: “No, to Windfarm Project”. 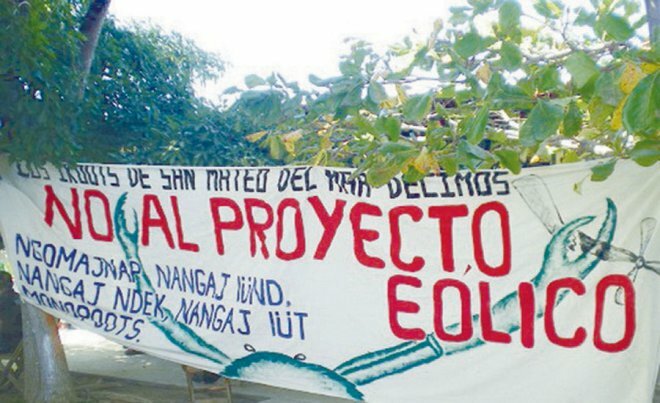 Mexico City – Indigenous Communities on the Isthmus of Tehuantepec won a provisional amparo to stop “the authorizations, permits, clearances, approvals, licences and land use changes” for implementing the Southern Windfarm Energy megaproject. Cruz also recalled that the Southern Windfarm Energy company belongs to the same group of businessmen who established the Mareña Renewable company in 2012. Two years ago, the indigenous peoples won another amparo, but now the same group shows up again under another name. Attorney Ricardo Lagunes Gasca explained that the Juchitán communities filed the amparo petition against the [municipal] council for the issuance of permits and land use changes for the production of electricity through wind power, but it only benefited the Southern Windfarm company, which is business partners with, among others, the Oxxo convenience store chain and Cuauhtémoc Brewery consortiums. Raymundo Regalado, community leader, warned of possible violent reactions against defenders of the land. They have already received death threats for opposing the windfarm megaprojects. The family of Bettina Cruz has been the victim of an attack and the Regalado family is under 24-hour guard.